Move mouse cursor over image to see NGC labels. This image was selected as the Astronomy Picture of the Day on 26 January 2001, and it has been licensed to Prentice Hall for Astronomy Today. This picture is of the heart of the most spectacular cluster of galaxies (50 million light years away) visible with smaller instruments. 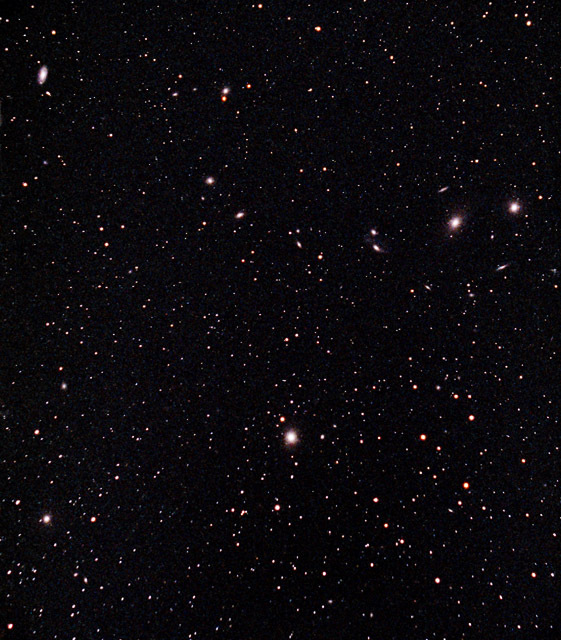 I probably haven't labeled even half of the galaxies visible in the image. Sorting through the dozen Messier galaxies in this region is one of the more time consuming tasks during a Messier marathon. The giant elliptical galaxy M87 is the locus of the cluster and itself contains 1 trillion stars. Each of these galaxies averages 100 billion stars (like ours). There are 100 billion such galaxies observable with our current technologies. I'm told that ic 791, ic 3393, ic 3382, ic 3363, and ic 3349 are also visible in this field.